With a new logo and ad campaign focused on customer service, along with a new membership plan that offers unlimited tech support — all of which debuted last month — Best Buy seems to be hoping for a fresh start with consumers. Data from YouGov BrandIndex suggests the retailer just might get it. 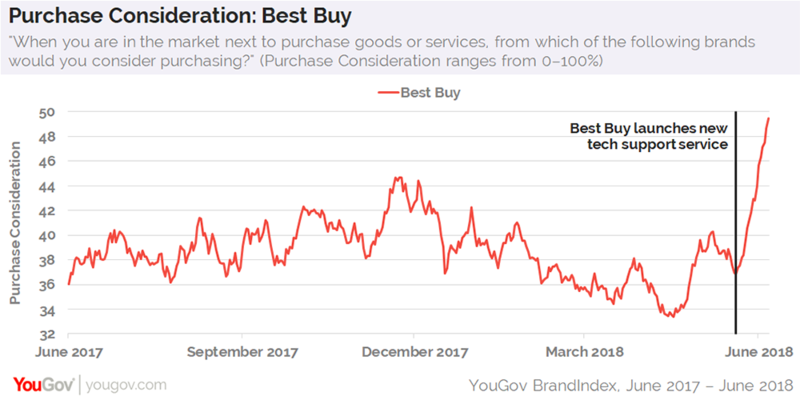 Best Buy’s Satisfaction score, which measures how satisfied or dissatisfied customers are with the brand, has jumped from a 38 on May 21 — the day prior to announcing its new tech support service — to a 47. This marks Best Buy’s highest Satisfaction score since early 2015. As noted by critics, and highlighted in its new commercials, Best Buy is trying to position itself as a great place to come for advice with today’s growing number of smart devices and appliances. And the strategy appears to be working: New data from YouGov Profiles reveals that 78% of US consumers who bought a good or service from Best Buy in the last 90 days value the opinion of experts when making a purchase decision, compared to 66% of US adults in general. In recent weeks, the amount of consumers open to shopping at Best Buy has also increased. On May 21, 37% of US adults said they were interested in making a purchase from the retailer; at present, 49% report the same.